This test is the only test which assesses a relationship according to the renowned approach to personality introduced by Carl Jung and popularized by Isabel Briggs Myers, that gives a quantitative measure of partners’ compatibility. 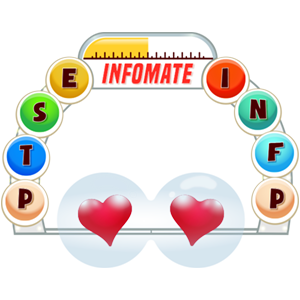 As a prerequisite to this test, you must have your and your partner’s personality type formulas and strengths of the preferences, for example I33 N25 T82 J60 and E100 N5 T30 J20 . You and your partner get it by completing the free Jung Typology personality test. First, ask your partner to share with you their type result – the type and scores or send you the link to their result. 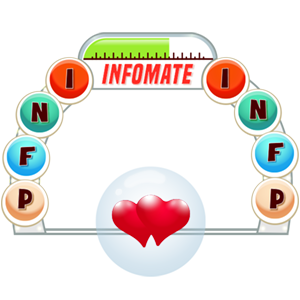 Next, you obtain and bookmark your own personality type result. 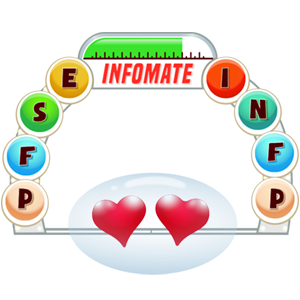 Open your and partner’s personality type result links and click “Use as Partner A” or “Use as “Partner B” accordingly, to automatically fill in the inputs into the Marriage Test below. 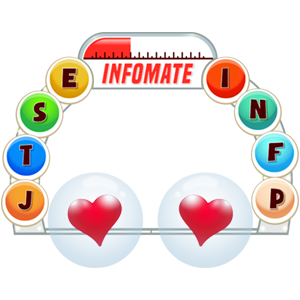 The premium report provides your overall MatchIndex™ along with an in-depth analysis of the four components of your informational compatibility and tips for optimal behavior. Sample. The free version is a rough, binary indication of “stable”/”unstable” relationship likelihood. Online payment will be securely processed by PayPal. After payment, you will be redirected to your test results. You can purchase a one-time use or multi-entry pass. You will be prompted to enter the desired quantity on the next screen. For multiple uses, you will receive a passcode. The unused credit does not expire. After pressing “Proceed” your premium results will be displayed, and a notification including your entered name and resulting jung marriage test™ will be emailed to your account administrator.